For years ‘Gold’ has been essential to Indians not just as jewelry but also like a long term investment. Each one of us is bound to find beautiful traditional gold jewelry in our mother or grandmother’s treasure chest. But with the precious yellow metal prices touching the sky, new trends even in jewelry are emerging in a big way. Not many of us get to see pure gold jewelry at weddings, parties even at red carpet events. Jewelry makers and designers have moved on from gold to other metals and gemstones. Today the jewelry is more like an extension of a person’s personality. Here are few of the traditional trends which have changed the face of Indian Jewelry in recent times. Though these two trends are pretty ancient in Indian jewelry originating in the states of Rajasthan & Gujarat, somehow they lost their glory few decades back when only yellow gold jewelry was at it’s peak. Thank- fully Kundan and Jadau are back bigtime with the help of jewelry designers who have managed to give it a contemporary look.One might have seen beautiful jewelry worn by Aishwarya Rain in the movie ‘Jodha Akbar’ and also in her own wedding with Abhishek. 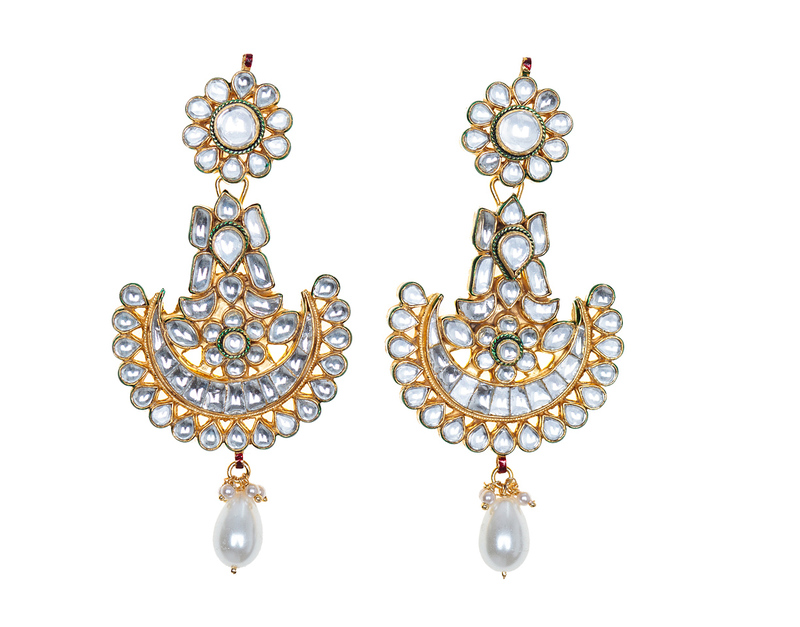 Kundan work is created by inserting gold foil between gemstones in which purest form of molten gold is used. These days even silver is used as a base to create Kundan jewelry. Beautiful engravings of flowers, leaves or birds is created by artisans and worn in form or necklace, earrings, rings or bangles. Wear it with a traditional lehenga, saree, salwar kameez or even an evening gown, the way to wear Kundan or Jadau is limitless. 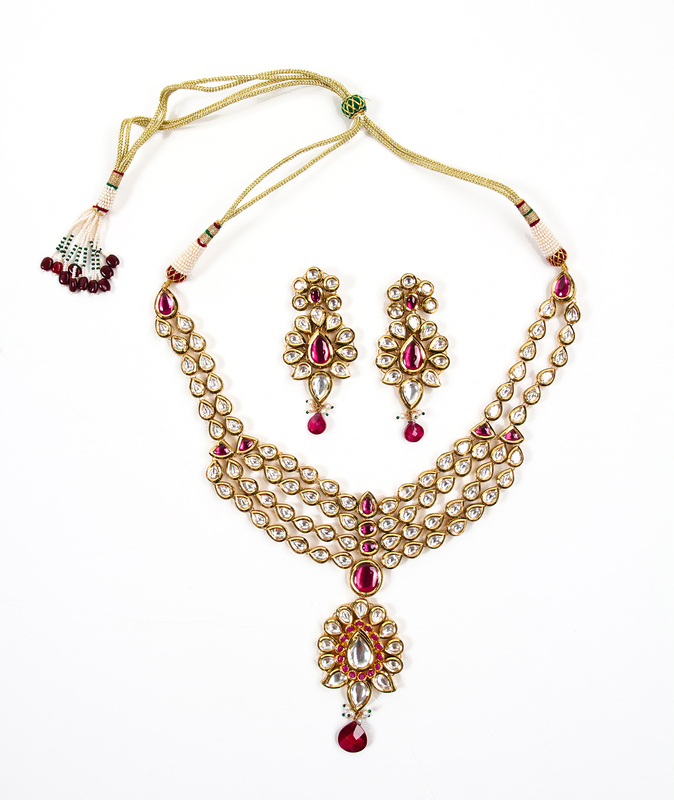 Uncut diamonds, rubies and emerald have been a designer’s favorite in this years jewelry exhibits in form of Polki. The colorful gems add loads of color to a simple outfit be it day wear or evening wear. Precious & semi-precious stones can be set on a base of various metals.Gemstones can be mixed and matched with a number of Indianwear. If your saree in a single color, add in glitter in form of colourful gemstones. But do take care not to overdo this style, like wearing a heavy gemstone necklace on a heavily embellished outfit. Try keeping the emphasis on the jewels only while keeping the outfit simple. A ‘must have’ in every Indian woman’s wardrobe and these days it can also be worn as a brooch or a hair accessory. The eternal favorite with all the fashionistas and celebrities – Pearls. Right from Audrey Hepburn to our very own Sonam Kapoor, pearls are the one accessory which can be worn in any season, by women of any age, with any type of outfit Indian or western. A strand of white pearls can even transform a dull outfit into an alluring one. A wedding trousseau is definitely incomplete with pearl jewelry infact many women have started opting for pearl jewelry for wedding receptions. For everyday wear, one can opt for earrings, bracelets or a pendant while for evening wear try pearls in various shades like pink, grey or black for a more glamour. ‘Minakari’ or art of enamel work was introduced by the Mughal in India, this art is best made in Rajasthan. 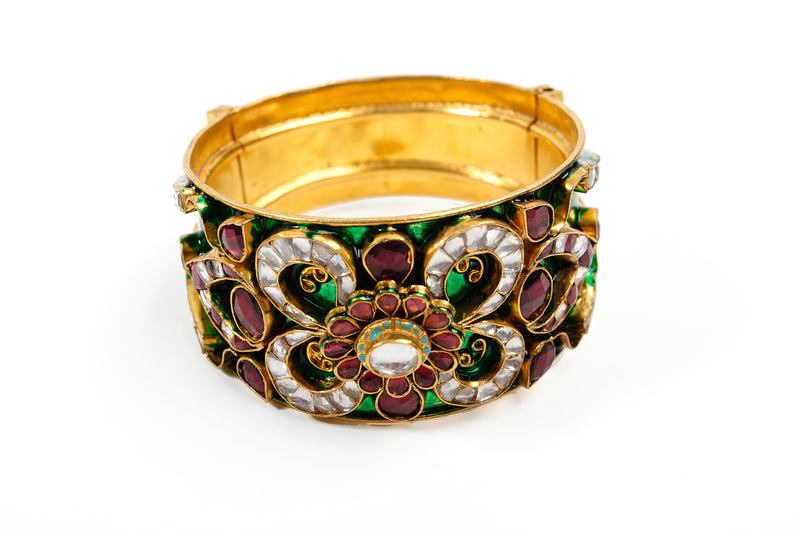 Enamel is filled in the golden engravings to create ‘Minakari’jewelry. Though the contemporary form of this art would be to combine it with diamonds, pearls and various other gemstones. It is no more restricted to be worn with traditional Indian attire only. You can adorn your western ensemble as well with this colorful enamel art. Eminent Designers like Alpana Gujral have created ‘Minakari’ cuffs, earrings and neck pieces that can be worn for cocktail parties as well. Try out these latest jewelry trends with our newest Jewelry Collection now!